The number of ships getting hijacked by pirates in the Gulf of Aden is increasing. BIMCO press release dated September 18 urges the International Maritime Organization (IMO) and the United Nations for real and immediate action against brazen acts of piracy, kidnapping and armed robbery, carried out with increasing frequency against ships in the Gulf of Aden, by pirates based in Somalia. 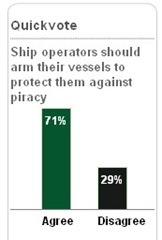 As per the world opinion as on September 21, 71 percent agree that ship operators should arm their vessels to save themselves from pirates. Spare some time to participate in the polling. 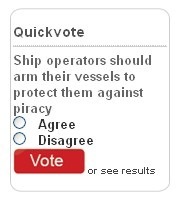 Click the above image to take part in polling. Your opinion matters a lot.